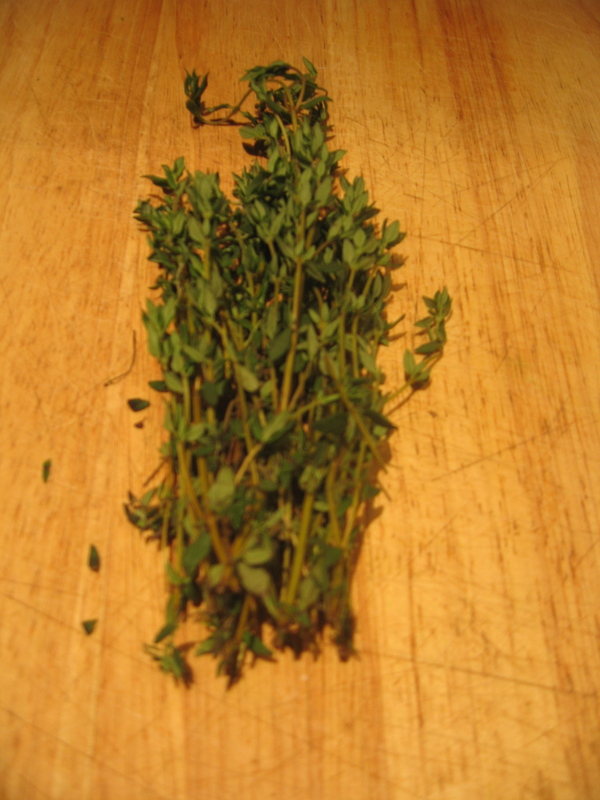 Thyme has always been one of my favorite herbs – it does absolute wonders for soups, roasted chickens, and other Provencal dishes. After a long holiday weekend filled with overeating and lounging, you’d think I’d be ready to tackle something really intricate and difficult for this week’s post… unfortunately I’ve learned the hard way that lounging can only lead to more lounging. So I settled for something simple – a recipe from Real Simple. Begin by pre-heating your oven to 400. Mix all ingredients thoroughly in a small bowl. 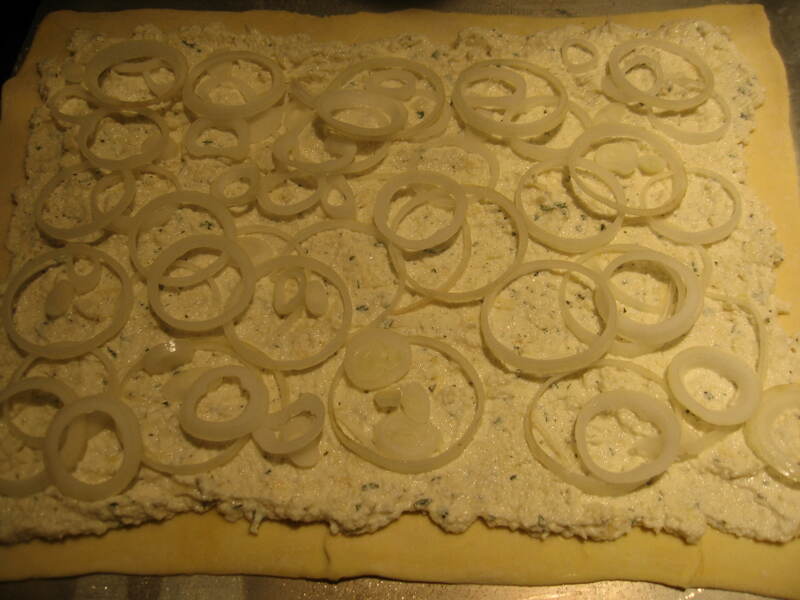 Roll out one sheet of store-bought puff pastry (I like Pepperidge Farm) on a floured board to about 9” x 13”. It is easiest to work with if you defrost it overnight in the refrigerator. Place the puff pastry on a greased baking sheet. Spread the topping evenly over the surface of the puff pastry leaving a ½ inch border around the edge. Slice one small onion very thinly and sprinkle over the top. Drizzle with about 1 tablespoon of olive oil. If you like, you can toast 2 tablespoons of pine nuts and toss them over the top of the finished tart. Unfortunately for me, “the pine nuts had not yet arrived” according to my local grocery representative. So I had to do without. The tart smelled absolutely delightful while it was baking. And then I severely burned the roof of my mouth eating a slice before it had cooled. It was very delicious – but if I were to make it again, I would use slightly less of the topping, eating that much ricotta at once made me feel slightly ill. In a good way of course. 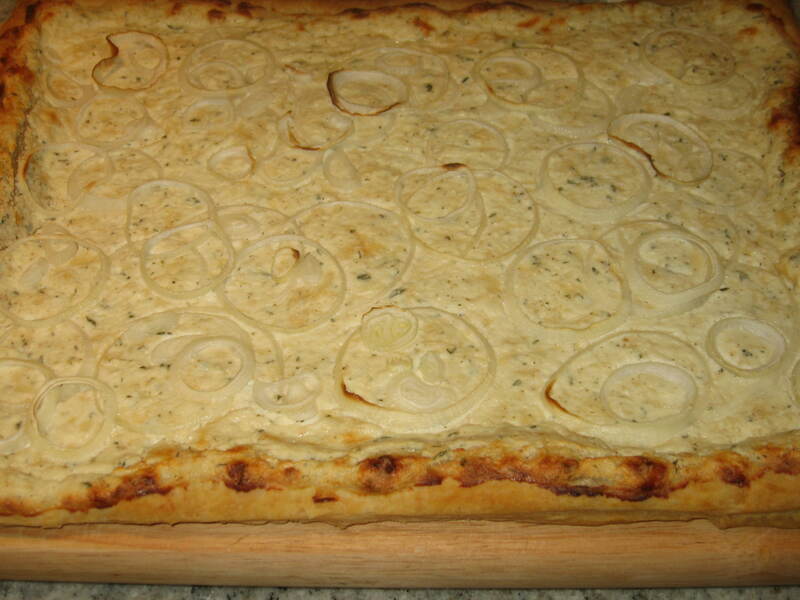 This entry was posted in Thyme and tagged bake, olive oil, parmesan, puff pastry, Real Simple, tart, thyme. Bookmark the permalink. I can almost smell it — great writing! Mmmm, looks amazing! I’m usually very pleased by recipes I find in Real Simple – I’m going to have to give this one a try! My holiday merrymaking really got the best of me so I’m moving a little slow today – this kitchen needs to get herself together – my post to follow shortly!